A report on RTÉ’s Prime Time detailed a series of emails between pilots and the search and rescue operator in 2013. RTÉ's Prime Time revealed that concerns had been raised about the terrain warning system in 2013. A PILOT HAD raised concerns four years ago that Black Rock island off Mayo was not on the onboard warning systems that Coast Guard search and rescue teams use, but no action was taken. A report on RTÉ’s Prime Time this evening detailed these issues were flagged well before Rescue 116 went down in March. 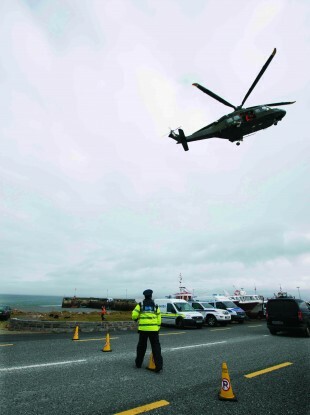 The Coast Guard’s Search and Rescue service is run by private operator, CHC Ireland, which won a 10-year €500 million contract to provide the service in 2012. Each helicopter has been equipped with an enhanced ground proximity warning system (EGPWS) since 2013. This system is designed to warn pilots to take appropriate action to avoid a collision if they get too close to terrain or some obstacle. The EGPWS can only work when it has a complete map of the terrain and obstacles. Black Rock island was not on this system. The crew on board Rescue 116 did not receive the warning about the island until it was too late. That company – called Honeywell – told RTÉ that it couldn’t comment due to the ongoing investigation into the crash. A spokesperson for CHC also said the company could not comment on this specific case, but said that it has “multiple systems and programmes that encourage employees to report any safety concerns”. There were also claims that the EGPWS provided inaccurate data on other terrains around Ireland, including Skellig Michael off Kerry. That data was provided by the Irish Aviation Authority, and it said that it only learned that its data for Skellig Michael was incorrect nine days after the Rescue 116 crash. Until 24 March this year, the official IAA aeronautical map had the island at just 174 feet high. That is in fact the height of the lighthouse on the island. Its actual height is 712 feet. The IAA has since issued a revised map. Email “Pilot flagged concerns that island was not on mapping system 4 years before Rescue 116 crash”. Feedback on “Pilot flagged concerns that island was not on mapping system 4 years before Rescue 116 crash”.